I officially have a new favorite sauce for summer: chermoula! Typically used for grilling meat and fish in Moroccan cuisine, this sauce is loaded with fresh cilantro, parsley, onion, garlic, lemon juice and spices. There are very few sauces that pack the tart and tangy flavor punch that chermoula does, and now that I have experienced it I am totally hooked. I had never even heard of chermoula until I found a recipe for Chermoula Fish Kebabs a few weeks ago. It was one of those instances where an image jumps out at you from Pinterest and makes you instantly hungry. After reading the recipe through, I knew that a mix of summer squash, peppers, and halloumi cheese would make a tasty vegetarian stand-in for the swordfish on the skewer. Halloumi is made from a mixture of goat’s and sheep’s milk. Largely found in Greek and Middle Eastern cuisine, it holds together well (almost like a saltier, more flavorful version of mozzarella) and is perfect for grilling due to its high melting point. When fried or grilled, the outside gets a crispy crust and the inside stays creamy. You can usually find halloumi in natural foods stores or co-ops, but look for it in a Greek or Middle Eastern market if there’s one near you. Its popularity for grilling has increased over the past couple years, so you may also have luck in bigger mainstream grocery stores. Alongside these chermoula veggie kebabs, we threaded Sun Gold tomatoes on skewers, lightly brushed them with olive oil and grilled them until they were slightly blistered. It was the perfect, easy accompaniment to the veggie-and-cheese skewers. These veggie-and-cheese kebabs are marinated in and basted with a fresh and tangy chermoula sauce—perfect for a summery weeknight meal. In the bowl of a food processor fitted with the S-blade, combine the ingredients for the chermoula. Process until the mixture forms a thick paste—not a smooth paste, but textured (you should be able to see the flecks of herbs). Set aside. Cut the vegetables and cheese into 1/2-inch thick pieces and place them in a large bowl with the chermoula paste. Toss to coat and cover with plastic wrap; marinate at room temperature for 30-45 minutes. Thread the marinated veggies and cheese onto skewers, alternating veggies and cheese, and adding in 2-3 bay leaves per skewer. Preheat a grill pan over medium-high heat. When hot, brush the pan with olive oil and cook the skewers until the vegetables are lightly charred all over, about 10 minutes, basting with chermoula every few minutes and turning occasionally. Remove from grill and serve over rice, quinoa, millet. I served our veggie skewers with skewers of blistered Sun Gold tomatoes over a bed of long grain white rice mixed with some of the leftover chermoula sauce and thinly sliced green onions. You had me at halloumi!! I just did a happy dance at Trader Joe’s when I saw they’ve started carrying Halloumi. Now I want to smother it in chermoula! 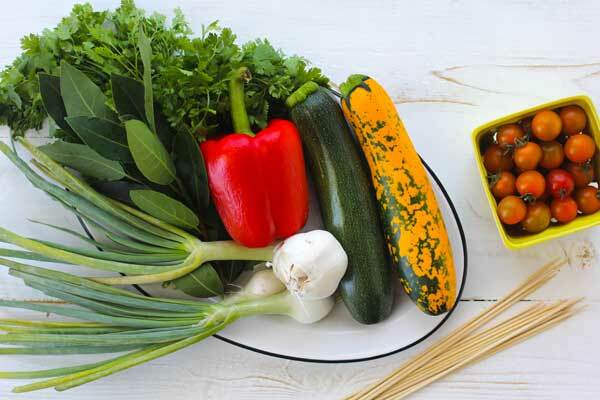 I love Mediterranean spices and flavors almost as I love grilled veggies. I’ve been keeping my eye out for halloumi but haven’t come across it yet 🙁 Thanks for sharing! definitely recreating this recipe for my vegetarian household.. looks delicious! I love cheese anyway, grilled is one of my favorites! I’ve never tried chermoula but those flavors sound incredible. I could easily live off these kebabs! I think chermoula might be the new pesto!! Seems so fresh and delicious. 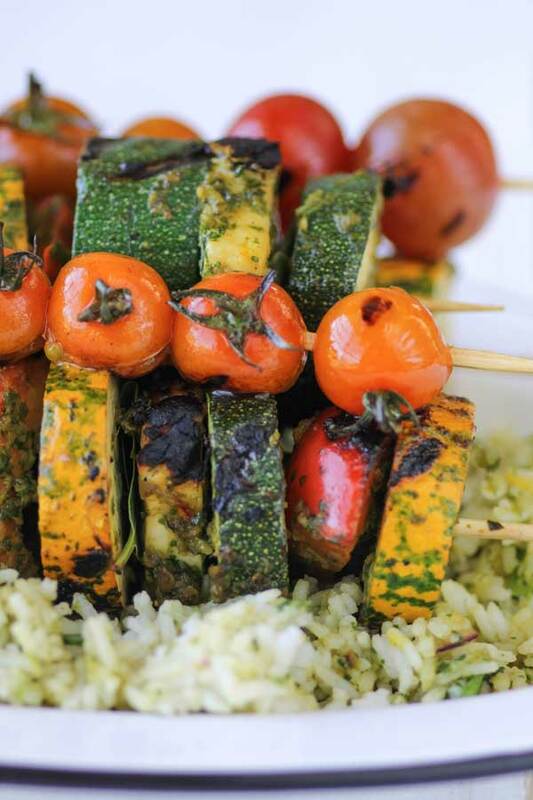 Love the idea of it slathered all over these veggie kebabs! I have used chermoula seasoning for years, usually on fish. But these veggie skewers look awesome, especially since I love halloumi cheese and don’t eat it often enough. I have used chermoula for a long time now, mostly for fish, but these veggie skewers look really good and I love halloumi cheese too. This one’s for me. Did you know that Sweden is the world’s second highest consumer of halloumi outside of Cyprus? When I first moved there my jaw dropped at the towers of halloumi in all of the grocery stores. Love it! I often grill it, and these kebabs look great. I’ll have to try out that chermoula sauce and get my grill on! I made this tonight in a foil pan instead of as kebabs, and served it over Israeli couscous. Wow! It is so delicious!! Chermoula might be my new favorite marinade! Now, this will be added onto my to try list – actually my husband’s to do list for a Saturday barbecue. I have never heard of chermoula sauce, but it’s making my mouth water. I am so excited for grilling season!